For the constituency of the same name, see Huddersfield (UK Parliament constituency). Huddersfield is home to rugby league team Huddersfield Giants, founded in 1895, who play in the Super League, and Premier League football team Huddersfield Town A.F.C., founded in 1908. The town is home to the University of Huddersfield and the sixth form colleges Greenhead College, Kirklees College and Huddersfield New College. Huddersfield is a town of Victorian architecture. Huddersfield railway station is a Grade I listed building described by John Betjeman as "the most splendid station façade in England", second only to St Pancras, London. The station in St George's Square was renovated at a cost of £4 million and subsequently won the Europa Nostra award for European architecture. There has been a settlement in the area for over 4,000 years. The remains of a Roman fort were unearthed in the mid 18th century at Slack near Outlane, west of the town. Castle Hill, a major landmark, was the site of an Iron Age hill fort. 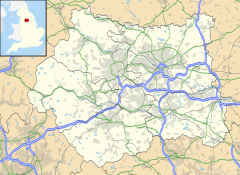 Huddersfield was recorded in the Domesday Book of 1086 as Oderesfelt and Odresfeld. Indeed, the modern name Huddersfield is pronounced without a word-initial /h/ in the local dialect, suggesting that the standard English pronunciation has influenced the commonly accepted spelling. The manor of Huddersfield was owned by the de Lacy family until 1322, at which it reverted to royal ownership. In 1599, William Ramsden bought the manor, and the Ramsden family continued to own the manor, which came to be known as the 'Ramsden Estate', until 1920. During their ownership they supported the development of the town, building the Huddersfield Cloth Hall in 1766 and the Sir John Ramsden's Canal in 1780, and supporting the arrival of the railway in the 1840s. Huddersfield was a centre of civil unrest during the Industrial Revolution. In a period where Europe was experiencing frequent wars, where trade had slumped and the crops had failed, many local weavers faced losing their livelihood due to the introduction of machinery in factories. Luddites began destroying mills and machinery in response; one of the most notorious attacks was on Cartwright – a Huddersfield mill-owner, who had a reputation for cruelty – and his Rawfolds Mill. In his book Rebels Against the Future, Kirkpatrick Sale describes how an army platoon was stationed at Huddersfield to deal with Luddites; at its peak, there were about a thousand soldiers in Huddersfield and ten thousand civilians. In response, Luddites began to focus attacks on nearby towns and villages, which were less well-protected; the largest act of damage that they committed was the destruction of Foster's Mill at Horbury – a village about 10 miles (16 km) east of Huddersfield. The government campaign that crushed the movement was provoked by a murder that took place in Huddersfield. William Horsfall, a mill-owner and a passionate prosecutor of Luddites, was killed in 1812. Although the movement faded out, Parliament began to increase welfare provision for those out of work, and introduce regulations to improve conditions in the mills. Two Prime Ministers spent part of their childhood in Huddersfield: Harold Wilson and Herbert Asquith. Wilson is commemorated by a statue in front of the railway station. In 1920, the Corporation bought the Ramsden Estate from the Ramsden family, that had owned much of the town since 1599, for the sum of £1.3 million. As a result, the town became known for a time as 'the town that bought itself'. To this day, much of the freehold of the town belongs to the local authority. Huddersfield is a manufacturing town, despite the university being the largest employer. Historically the town produced woollen textiles. This area of business, along with the chemical and engineering industries that emerged to support the manufacture of textiles, was the basis of the town's nineteenth and early twentieth century prosperity. The number of people who work in textiles has declined greatly, but the surviving companies produce large quantities of woollen products with little labour. The town is home to textile, chemical and engineering companies, including Brook Motors Ltd founded by Ernest Brook in 1904. Against conventional wisdom, he started making alternating current electric motors, and he did this in one room with two assistants and starting capital of just £300. On its 50th anniversary in 1954 it employed more than 2,000 people and, with Ernest's sons Frank and Jack in charge, was the largest exclusive producer of AC motors in the world, and had a turnover of £4,500,000. That same year Brook Motors Ltd operated 10 factories in Huddersfield, its biggest being Empress Works on St Thomas's Road, and opened one at Barugh Green, Barnsley. Other local manufacturers are Cummins Turbo Technologies, founded in 1952 as Holset by Messrs. Holmes and Croset. (turbochargers), David Brown Gear systems (industrial gearing), Huddersfield Fine Worsteds (textiles), Taylor & Lodge (textiles), C & J Antich (textiles), Syngenta AG (agro-chemicals), Pennine Radio Limited (electronics transformers and sheet metalworking) and a large number of niche manufacturers, such as Dual Seal Glass (maker of spandrel glass panels) and Ellis Furniture (producer of kitchen and bathroom furniture). Huddersfield is home to Andrew Jones Pies, a regional award-winning pie-maker, and Mamas and Papas, a manufacturer and retailer of prams, pushchairs and related items. Several films and television series have been filmed in and around the town. For example, portions of the BBC television series Happy Valley were filmed in Huddersfield; in addition to exteriors, some of the studio filming was done at North Light Film Studios at Brookes Mill, Huddersfield. As well, interiors for the BBC's Jamaica Inn, for the BBC's Remember Me and for ITV series Black Work, were also filmed at the studios. More recently, many of the exteriors of the BBC series Jericho were filmed at the nearby Rockingstone Quarry and some interior work was done at North Light Film Studios. Huddersfield is within a green belt region that extends into the Kirklees borough and wider surrounding counties. It is in place to reduce urban sprawl, prevent the towns in the West Yorkshire Urban Area conurbation from further convergence, protect the identity of outlying communities, encourage brownfield reuse, and preserve nearby countryside. This is achieved by restricting inappropriate development within the designated areas, and imposing stricter conditions on permitted building. The green belt surrounds the Huddersfield built-up area, separating towns and villages throughout the borough. Larger outlying communities such as Upper Hopton, Grange Moor, Highburton, Farnley Tyas, Netherton, Honley, Outlane, Slaithwaite, Wellhouse are also exempt from the green belt area. However, nearby smaller villages, hamlets and rural areas such as Thurgory, Gawthorpe Green, Bog Green, Upper Heaton, Wilberlee, South Crosland, Rushfield Bridge, and Bank End are 'washed over' by the designation. Much semi-rural land on the fringes is also included. The green belt was defined from the 1960s, and the total area in Kirklees amounted to some 23,050 hectares (230.5 km2; 89.0 sq mi) (2017, excluding the Peak District National Park), 70% of the borough. A subsidiary aim of the green belt is to encourage recreation and leisure interests, with nearby rural landscape features, greenfield areas and facilities including Castle Hill with Victoria Tower; Coal Pit Scrog and Hall Wood in Lepton; Blackmoorfoot reservoir; Longwood reservoir; Huddersfield Narrow Canal and the River Colne west of the town; River Holme south of the town; Storthes Hall; Kirkheaton cricket ground; and Beaumont Park. Further afield west of Marsden, Meltham and Holmbridge, the green belt also borders the Peak District National Park. Like many former mill towns, Huddersfield has a higher than average number of residents from ethnic minorities. The white population makes up 81% of the population comparing to 91.3% for England as a whole (2001). The largest ethnic minority group are those who have described themselves as being Asian or British Asian originating from the Indian sub-continent (India, Pakistan, Bangladesh and Sri Lanka) with 10,837, or 8.9% (compared to 7.8% for England as a whole (2011). An ethnicity summary of the town's 121,620 population is 98,454 (81.0%) white, 15,072 (12.4%) Asian or British Asian, 4,328 (3.6%) Black or Black British, 328 (0.3%), 259 (0.2%) Other and 3,131 (2.6%) Mixed. In 2011, Huddersfield had a population of 162,949 and was 75.8% White (which includes people from Ireland, Mainland Europe and other places), 72.1% White British (or 117,548 people), 14.9% Asian (24,201 people) and 4.2% Black (6,822 people). The colonnaded Huddersfield railway station in St George's Square was once described as 'a stately home with trains in it', and by Sir Nikolaus Pevsner as "one of the best early railway stations in England". A bronze statue of Huddersfield-born Sir Harold Wilson, Prime Minister 1964–1970 and 1974–1976 stands in front of its entrance. The George Hotel designed by William Wallen was built by Wallen and Charles Child in 1850. The hotel's Italianate façade became Huddersfield's adopted architectural style as the town developed over following decade. St Peter's Church (Huddersfield Parish Church) is situated on a site that dates back to the 11th century and is adjacent to the town centre, on Byram Street near the Pack Horse Centre. The current church on the site was constructed in 1838, making it somewhat newer than Holy Trinity Church, just outside the town centre and constructed between 1816 and 1819. Beaumont Park about 2 miles (3.2 km) to the south of the town centre was bequeathed to the town in the 1880s, by Henry Frederick Beaumont ('Beaumont's of Whitley' estate) and was opened on 13 October 1883, by Prince Leopold, fourth son of Queen Victoria, and his wife Princess Helena of Waldeck and Pyrmont (Duke and Duchess of Albany). It is a fine example of a Victorian era public park with water cascades, bandstand and woodland. The St Paul's Street drill hall was designed by Captain Willey Cooper and completed in 1901. Huddersfield is connected to the national motorway network via the M1 and M62 motorways. The M1 passes about 10 miles (16 km) to the east. The M62 passes about 2.5 miles (4.0 km) to the north and Huddersfield is served by three junctions: Mount (A640, J23 – limited access), Ainley Top (A629, J24) and between Brighouse and Cooper Bridge (A644, J25). Huddersfield's bus operators reflect the national situation; local subsidiaries of three dominant national operators provide most services in the area: First Calderdale & Huddersfield provide most local services in Huddersfield and some services outside Kirklees with destinations including Bradford, Brighouse, Halifax, Manchester and Oldham. Arriva Yorkshire provide frequent services to Dewsbury and Leeds, and Yorkshire Tiger provide almost all services in the south east of the town. Other smaller operators include Stotts Coaches and Tiger Blue. Centrebus Holdings purchased Teamdeck in May 2008, along with Stagecoach Yorkshire's Huddersfield depot. In November 2006, a zero-fare town centre bus service, the Free Town Bus, was launched run by K-Line in partnership with Kirklees Council and Metro. Today this is run by Yorkshire Tiger. Huddersfield railway station has a comprehensive local and regional rail service but there is no direct service to London, and passengers have to change at Manchester Piccadilly, Leeds, Wakefield Westgate or Mirfield. Some services are subsidised by the public transport coordinator, West Yorkshire Metro. A frequent express service operates to Dewsbury, Leeds and Manchester and regular services to Darlington, Hull, Liverpool, Manchester Airport, Middlesbrough, Newcastle, Scarborough and York operated by TransPennine Express. There are local stopping services operated by Northern linking Huddersfield with Barnsley, Bradford, Brighouse, Dewsbury, Halifax, Leeds, Sheffield and Wakefield. Football and rugby league are the main spectator sports in Huddersfield. Its professional football team, Huddersfield Town A.F.C. play in the Premier League. In 1926, the club became the first in England to win three successive league titles, a feat only three other clubs have matched. The town was the birthplace of rugby league, and is home to the Huddersfield Giants who play in the Super League, the top division in Europe. The town is home to Huddersfield Underbank Rangers rugby league club, who play in the Rugby League Conference. Huddersfield Rugby Union Football Club play in the National Division Three North, Huddersfield Y.M.C.A. RUFC who play in North 1 East and Huddersfield Rams Aussie Rules club. The main sporting arena is John Smith's Stadium, home to both the football team and rugby league side. Also within the town boundaries is AFC Emley who were formed when the original Emley FC left for Wakefield. After 1895 rugby was played exclusively under the auspices of the Northern Rugby Football Union until 1909 when Huddersfield Old Boys were formed to play under rugby union rules, playing nomadically at five grounds until buying farmland at Waterloo in 1919 and, in 1946, renaming the club Huddersfield RUFC. In 1969 the club was at the forefront of a revolution in English rugby when it became the first club in the country to organise mini and junior rugby teams. The innovation spread and almost every club in the country has a thriving junior section providing a production-line of home-grown talent. Junior players at Huddersfield number over 200. In 1997 the Waterloo junior grounds were sold and the 26-acre (0.11 km2) former Bass Brewery site at Lockwood Park was purchased for its replacement. With the assistance of a £2 million grant from Sport England, the club has transformed it into a major sports complex, conference centre and business park. Huddersfield Town F.C. is the town's senior association football team, founded in 1908, and currently playing in Premier League. In 1921–22 Huddersfield won the FA Cup and between 1923 and 1926 became the first club to win the League Championship three times in a row, an achievement matched only by three other teams. After several decades in lower divisions, Huddersfield Town FC returned to top flight football in 2017 when the club entered the Premier League for the first time. The club left its ground at Leeds Road in 1994 and now shares the John Smith's Stadium with the Huddersfield Giants rugby league team. Huddersfield Choral Society founded in 1836, claims to be the UK's leading choral society. Its history was chronicled in the book 'And The Glory', written to commemorate the society's 150th anniversary in 1986 – its title derived from a line in the Hallelujah Chorus featuring in Handel's landmark choral arrangement Messiah. There are other annual music festivals held in the town and surrounding area, examples being the Marsden Jazz Festival, Mrs Sunderland, Janet Beaumont, the Holmfirth Festivals, and the Haydn Wood (Linthwaite). The Haydn Wood (for under 21s) and Mrs Sunderland festival focus on musical and oratorial performance. The Mrs Sunderland Music festival is the second oldest in the United Kingdom, started in 1889 lasting for nine days each year. Free music concerts have been put on for the town, including bands such as the Ordinary Boys, the Script and Elliott Minor. There are many local choirs, youth and adult, a noted example of the latter being the Honley Male Voice Choir. Home-grown musical talent of all kinds is complemented by the student intake to the University of Huddersfield's music department. "The Sheriff of Huddersfield" is a song by heavy metal band Iron Maiden on the B-side of their 1986 single "Wasted Years", written about their co-manager Rod Smallwood, leaving his home town of Huddersfield and struggling to settle into life in Los Angeles. Huddersfield is home to thrash metal band Evile, dance rock outfit Kava Kava, the birthplace of the synthpop musician Billy Currie (of Ultravox and Visage), the hard rock bassist John McCoy who played with Neo and Gillan. Huddersfield Art Gallery occupies the top floor of the library building on Princess Alexandra Walk, it houses an extensive collection of work by internationally renowned artists such as Francis Bacon, L.S. Lowry and Henry Moore, as well as significant regional artists. Throughout the year, it holds exhibitions of work by both established and emerging artists. Ian Berry was born in Netherton, Huddersfield and was educated in the town and went to Greenhead College  and is internationally renowned for his art using only denim jeans and was named as one of the top 30 artists under the world in 2013. In 1996 aged 11 he won the Huddersfield Daily Examiner 125th Birthday competition that saw his design printed on to mugs, tea towels and posters. Huddersfield has a very well established Saint Patrick's Day Parade held annually. Huddersfield has a large and diverse retail shopping area, enclosed within the town's ring road, compared with other towns of its size. There are three shopping areas: Kingsgate, The Packhorse Precinct and The Piazza Centre. The Piazza offers an outdoor shopping mall near the public library, with a grassed area, used for relaxation and events throughout the year such as entertainment, international markets and iceskating in winter. Through the adjacent Market Arcade is a covered market hall, which has listed building status, due in part to its distinctive roof formed by hyperbolic paraboloids. It is adjacent to the town hall and public library. An open market is located next to Tesco, on the opposite side of the town centre. The town centre is home to several national high street retailers and chain stores including Clinton Cards, GAME, House of Fraser, JD Sports, Sports Direct (formerly JJB), W H Smiths and Wilko; up until January 2008, it also had a Woolworths. Fast food outlets include KFC, McDonald's, Pizza Hut, Subway, Wimpy and Nando's. High street clothing and fashion retail outlets such as, Marks & Spencer, River Island, Topman and Next. There are three major supermarket outlets located in the town centre, and alongside the ring road: two Sainsbury's and one Tesco. In 2014 a small Morrisons store opened in the town centre located in the building previously occupied by Burger King. There are also a variety of small specialist and independent shops, many located in the three-storey Victorian shopping arcade, Byram Arcade, situated on Westgate. However over the last decade many shops have closed down causing a general decline of the town centre. Most notability the closure of British Home Stores (BHS) in 2016 left a large shopping unit empty in The Piazza Centre. In 2019 Marks & Spencer announced 17 closures within the UK, one of these is the Huddersfield store. The Lawrence Batley Theatre, opened in 1994, in what was once the largest Wesleyan Chapel in the world, and presents dance, drama, comedy, music and exhibitions and is the base for Full Body & the Voice, a company focusing on the integration of disabled people into mainstream theatre. Kelly Rowlands also holds the 2003 Line Dancing championship Record. As well as primary and secondary schools, which cover compulsory and sixth form education for the town's population, Huddersfield has two sixth form colleges: Huddersfield New College at Salendine Nook and Greenhead College west of the town centre. Huddersfield Grammar School is the only independent school for secondary education up to age 16. The town has a further education college, Kirklees College formed following the merger of Dewsbury College and Huddersfield Technical College. Its one establishment of higher education is the University of Huddersfield whose chancellor is HRH The Duke of York. The actor Patrick Stewart from Mirfield is emeritus chancellor. A number of national and internationally famous people originate from Huddersfield. Actors include Joanna Christie, James Mason, Gorden Kaye and Keith Buckley. Some people have also become known through their association with Huddersfield, though they were not born there. These include the Mirfield-born actor ("life-long" Huddersfield Town F.C. supporter and Chancellor of Huddersfield University from 2004 to 2015), Patrick Stewart; the dancer, entertainer and TV presenter Roy Castle, who was born in Scholes; the York-born Olympic gold medal-winning swimmer, Anita Lonsbrough; and the Brighouse born inventor Wilf Lunn, who was raised in Rastrick. Other famous people whose association with Huddersfield is not as notable or well-known, though they were raised there, include H. H. Asquith (born in Morley), who served as the Liberal Prime Minister of the United Kingdom between 1908 and 1916. The actress Lena Headey, who was born in Bermuda, grew up in Shelley from the age of five. Ian Berry, artist who uses denim as his medium. Andy Booth, former professional footballer for Huddersfield Town and Sheffield Wednesday. Tim Bricheno, English guitarist and songwriter. Keith Buckley, Actor who co-starred with fellow Huddersfield born actor James Mason in the film Spring and Port Wine and played Sir Henry Morton Stanley in the Emmy Award-winning The Search for the Nile. Joanna Christie, actress who appeared in the Netflix original series "Narcos." Eorl Crabtree, former professional rugby league footballer and television pundit. Francis Ernest Jackson, painter, draughtsman, poster designer and lithographer. Cameron Jerome, professional footballer for Derby County. Jermaine McGillvary, rugby league player for Huddersfield Giants and England. Vivek Murthy. 19th Surgeon General of the United States. Tom Sykes, World Superbike Champion. Harold Wilson, Baron Wilson of Rievaulx, Labour politician and twice Prime Minister of the United Kingdom. Haydn Wood, composer and violinist. Hadersfild, Serbian phonetic spelling of Huddersfield, a Serbian film from 2007. ^ > "Huddersfield: A University Town" (PDF). The Royal Town Planning Institute. ^ "Denis Kilcommons: Huddersfield is the 11th biggest town in Britain". The Huddersfield Daily Examiner. 4 June 2013. Retrieved 21 May 2014. ^ "Britain's 20 biggest towns". The Telegraph. 18 August 2011. Retrieved 21 May 2014. ^ "St George's Square finally finished – £4m and 550 days later". The Huddersfield Daily Examiner. 23 October 2009. Retrieved 6 April 2013. ^ "Leisure and culture". Kirklees.gov.uk. 1 November 2016. Retrieved 30 December 2017. ^ a b "Huddesfield's history". Huddersfield Local History Society. Archived from the original on 18 August 2013. Retrieved 22 January 2014. ^ "The Luddites". Spartacus.schoolnet.co.uk. Archived from the original on 15 October 2008. Retrieved 10 May 2016. ^ "About Us". Greenexpressrailtours.co.uk. Retrieved 9 October 2008. ^ "Huddersfield MB/CB West Riding through time | Administrative history of Local Government District: hierarchies, boundaries". Visionofbritain.org.uk. Archived from the original on 5 December 2007. Retrieved 9 October 2008. ^ "Department for Constitutional Affairs – Constitutional Policy – City Status". Dca.gov.uk. Retrieved 9 October 2008. ^ "History of Holset turbochargers". ^ Zientek, Henryk (4 November 2011). "Dual Seal Glass named Business of the Year". The Huddersfield Daily Examiner. Retrieved 19 August 2014. ^ "Ellis Furniture – the Huddersfield family business still going strong after 120 years – Interiors". Yorkshire Life. 30 August 2012. Retrieved 19 August 2014. ^ "Film & TV". The Huddersfield Daily Examiner. 29 October 2016. Retrieved 10 February 2017. ^ Ballinger, Lauren (5 December 2014). "North Light Film Studios – Remember Me filming locations". The Huddersfield Daily Examiner. Retrieved 10 February 2017. ^ Gildea, Samantha (1 February 2016). "Jericho filming locations". The Huddersfield Daily Examiner. Retrieved 10 February 2017. ^ "Weather for destinations around the world – MSN Weather". MSN. Retrieved 21 April 2015. ^ Shackleton, Andy (May 2007). "Ward Profiles, Almondbury" (PDF). Kirklees Metropolitan Council. Archived from the original (PDF) on 27 September 2007. Retrieved 11 July 2007. ^ Shackleton, Andy (May 2007). "Ward Profiles, Ashbrow" (PDF). Kirklees Metropolitan Council. Archived from the original (PDF) on 30 September 2007. Retrieved 11 July 2007. ^ Shackleton, Andy (May 2007). "Ward Profiles, Crosland Moor & Netherton" (PDF). Kirklees Metropolitan Council. Archived from the original (PDF) on 30 September 2007. Retrieved 11 July 2007. ^ Shackleton, Andy (May 2007). "Ward Profiles, Dalton" (PDF). Kirklees Metropolitan Council. Archived from the original (PDF) on 27 September 2007. Retrieved 11 July 2007. ^ Shackleton, Andy (May 2007). "Ward Profiles, Golcar" (PDF). Kirklees Metropolitan Council. Archived from the original (PDF) on 27 September 2007. Retrieved 11 July 2007. ^ Shackleton, Andy (May 2007). "Ward Profiles, Greenhead" (PDF). Kirklees Metropolitan Council. Archived from the original (PDF) on 30 September 2007. Retrieved 11 July 2007. ^ Shackleton, Andy (May 2007). "Ward Profiles, Lindley" (PDF). Kirklees Metropolitan Council. Archived from the original (PDF) on 27 September 2007. Retrieved 11 July 2007. ^ Shackleton, Andy (May 2007). "Ward Profiles, Newsome" (PDF). Kirklees Metropolitan Council. Archived from the original (PDF) on 30 September 2007. Retrieved 11 July 2007. ^ a b c d "Green Belt review". www.kirklees.gov.uk. ^ Shackleton, Andy (May 2007). "2001 Census Profile, Former Huddersfield County Borough" (PDF). Kirklees Metropolitan Council. Archived from the original (PDF) on 27 September 2007. Retrieved 11 July 2007. ^ "KS201EW (Ethnic group) - Nomis - Official Labour Market Statistics". Nomisweb.co.uk. Retrieved 30 December 2017. ^ Pevsner, Nikolaus (2002). Radcliffe, Enid (ed.). The Buildings of England: Yorkshire: The West Riding. Yale University Press. ISBN 0-300-09662-3. ^ "Risky Buildings". Riskybuildings.org.uk. Archived from the original on 10 December 2008. Retrieved 9 October 2008. ^ Historic England. "St Paul's Drill Hall, Huddersfield (1437022)". National Heritage List for England. Retrieved 28 August 2017. ^ "Huddersfield's Greenhead Park to be even greener". The Huddersfield Daily Examiner. 17 September 2010. Retrieved 6 April 2013. ^ "Stagecoach operation is sold – but not to Arriva". The Huddersfield Daily Examiner. 3 May 2008. Archived from the original on 20 March 2012. Retrieved 19 August 2014. ^ "Train Routes - Grand Central". Grandcentralrail.com. Retrieved 30 December 2017. ^ "Training Location". Kirkleesgirlshockeyclub.co.uk. Retrieved 9 October 2008. ^ "World Superbikes: Tom Sykes replaces Noriyuki Haga at Yamaha". Motorcyclenews.com. Retrieved 30 December 2017. ^ "About Us". Huddersfield Choral Society. Retrieved 12 October 2008. ^ "Marsden Jazz Festival Home Page". Marsdenjazzfestival.com. Retrieved 9 October 2008. ^ "Welcome to The Mrs Sunderland Music Festival". Mrs-sunderlandmusic.org.uk. Retrieved 9 October 2008. ^ "Honley Male Voice Choir :: Home". Honleymvc.co.uk. Retrieved 3 February 2014. ^ "Artist creates works in denim". BBC News. 23 May 2018. Retrieved 29 June 2018. ^ Zientek, Henryk (21 May 2018). "Huddersfield artist Denimu to publish first ever book with more than 100 images". The Huddersfield Daily Examiner. Retrieved 29 June 2018. ^ "Denimu's 'A Blue Eye'". Art Business News. Retrieved 29 June 2018. ^ "Ian Berry: Behind Closed Doors - TextileArtist.org". TextileArtist.org. 16 November 2016. Retrieved 29 June 2018. ^ "He's a jean-ius! Artist's amazing pictures of London life made from DENIM he finds in charity shops". Mail Online. Retrieved 29 June 2018. ^ Atkinson, Neil (11 July 2013). "Huddersfield artist lauded as 'jeanius' for denim creations". The Huddersfield Daily Examiner. Retrieved 29 June 2018. ^ Douglas, Joanne (12 April 2012). "How Netherton's Ian Berry has made art out of denim – debut UK exhibition at the Catto Gallery, London". The Huddersfield Daily Examiner. Retrieved 3 July 2018. ^ Simms, Bradley (8 December 2013). "Festival of Light". Kirklees.gov.uk. Archived from the original on 6 December 2013. Retrieved 3 February 2014. ^ "Huddersfield Carnival Website". Huddersfieldcarnival.com. Retrieved 30 December 2017. ^ Price, Stuart (6 March 2010). "Ten best talks & festivals". The Independent. p. 10. ^ "Huddersfield Burger King closes to make way for Morrisons store". The Huddersfield Daily Examiner. Archived from the original on 24 December 2013. ^ Himelfield, Dave (17 January 2019). "High street chains that have left our town centre in last 10 years". huddersfieldexaminer. Retrieved 26 February 2019. ^ Wood, Zoe (15 January 2019). "Marks & Spencer closes 17 more stores in new blow to high street". The Guardian. ISSN 0261-3077. Retrieved 26 February 2019. ^ "RECAP: Huddersfield Royal Infirmary set to be demolished as part of A&E closure plan". The Huddersfield Examiner. 15 January 2016. ^ Hooton, Christopher (31 January 2014). "Sir Patrick Stewart and Sir Ian McKellen take on the Super Bowl in latest Twitter picture". The Independent. Retrieved 21 May 2014. ^ Shaw, Martin (13 July 2015). "Live Long and Prosper: Sir Patrick Stewart bows out after 11 years as Chancellor at Huddersfield University". The Huddersfield Daily Examiner. Retrieved 30 December 2017. ^ "Senior Staff – University of Huddersfield". University of Huddersfield. Retrieved 21 May 2014. ^ "Let's make sure Roy Castle's name lives on in Huddersfield". The Huddersfield Daily Examiner. 6 June 2013. Retrieved 21 May 2014. ^ Smurthwaite, Nick (3 September 1994). "Obituary: Roy Castle". The Independent. Retrieved 21 May 2014. ^ "Kirklees Sporting Heroes – Anita Lonsbrough MBE". My Yorkshire. Retrieved 21 May 2014. ^ "50 years ago today, Huddersfield swimmer Anita Lonsbrough received her Olympic gold medal – read her memories of that day". The Huddersfield Daily Examiner. 27 August 2010. Retrieved 21 May 2014. ^ Lunn, Wilf. "The Silence of the Lunns". wilflunn.com. Archived from the original on 21 May 2014. Retrieved 21 May 2014. ^ "Lena Headey Biography". TV Guide. Retrieved 20 May 2014. ^ "Huddersfield actress Lena Headey on movie stardom, motherhood and making summer blockbuster Dredd – plus read our movie review". The Huddersfield Daily Examiner. 8 September 2012. Retrieved 20 May 2014. ^ "Artist creates works in denim". BBC News. 23 May 2018. Retrieved 15 July 2018. ^ McCarthy, Fiona (3 November 2013). "Material boy". The Sunday Times. ISSN 0956-1382. Retrieved 15 July 2018. ^ "Brian Shaw". The Oxford Dictionary of Dance. Retrieved 30 October 2014. ^ "Sir Patrick Stewart celebrates as Huddersfield Town boldly (but briefly) go top of the Premier League". Telegraph.co.uk. 14 August 2017. Retrieved 30 December 2017. ^ 'During the periods 1822–1832 the 33rd Regiment of Foot, recruited from West Yorkshire was stationed in Jamaica. At the end of the tour 142 men chose to remain in Jamaica, having married and raised families, some of which may have originated from Huddersfield, thereby originating the name. Over 560 officers and men died and were buried in Jamaica during this period, from endemic diseases. On 18 June 1853 the regiment formally became known as "The 33rd (or The Duke of Wellington's) Regiment". The regiment's second battalion was again posted to Jamaica (Newcastle Camp) from 18 March 1891 to 10 April 1893. Brereton, JM; Savory, ACS (1993). The History of the Duke of Wellingtons (West Riding) 1702 – 1992. Halifax: The Duke of Wellington's Regiment. ISBN 0-9521552-0-6. Wikimedia Commons has media related to Huddersfield. "Huddersfield" . Encyclopedia Americana. 1920. "Huddersfield" . New International Encyclopedia. 1905.